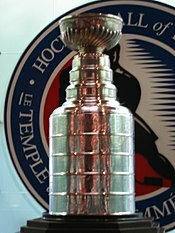 The 1994 Stanley Cup playoffs, the championship of the National Hockey League (NHL), began after the conclusion of the 1993–94 NHL season. The sixteen teams that qualified, eight from each conference, played best-of-seven game series for conference quarterfinals, semifinals and championships; and then the conference champions played a best-of-seven series for the Stanley Cup. The playoffs ended when the New York Rangers defeated the Vancouver Canucks in the seventh game of the 1994 Stanley Cup Finals. For the first time since joining the NHL, all four former WHA teams (Edmonton, Hartford, Quebec, and Winnipeg) failed to make the playoffs. Wayne Gretzky also missed the playoffs for the first time in his career. Conversely, the San Jose Sharks became the first post-1990 expansion team to make the playoffs. All series played between Central and Pacific Division teams had a 2–3–2 format to reduce travel. This was the last Canadian team appearance in the Final until 2004, and as of the end of 2017–18, remains the most recent time that two Canadian teams made it to the conference finals in the same year. The New York Rangers entered the playoffs as the Presidents' Trophy winners, the Eastern Conference regular season and Atlantic Division champions with 112 points. The Islanders qualified as the eighth seed earning 84 points during the regular season. This was the eighth playoff series between these two teams, with the Islanders winning five of the previous seven series. They last met in the 1990 Patrick Division Semifinals which the Rangers won in five games. The Islanders won the season series earning six of ten points during this year's five game regular season series. This was the third playoff series between these two teams, with Pittsburgh winning both previous series, and the most recent series being in the 1992 Patrick Division Semifinals which Pittsburgh won in seven games after erasing a 3-1 deficit. Until 2018, this was the only time the Capitals had defeated the Penguins in their first ten playoff matchups. Game six was the final playoff game in the Montreal Forum. This was the first playoff series between these two teams. This was the eighth playoff series between these two teams, with Toronto winning five of the seven previous series. They last met in the 1986 Division Semifinals which Toronto won in three games. Game six was the last NHL game played at Chicago Stadium. This was the tenth playoff series between these two teams, with St. Louis winning five of the nine previous series. They last met in the 1991 Division Final which Minnesota won in six games. This was the first time the city of Dallas was ever represented in the Stanley Cup playoffs. Game four was the last game ever at St. Louis Arena. This was the fourth playoff series between these two teams, with Washington winning two of the previous three series. They last met in the 1991 Division Semifinals which Washington won in six games. They would not meet in the playoffs again until 2009. This was the second playoff series between these two teams, with New York winning the only previous series. They last met in the 1992 Division Semifinals, which New York won in seven games. This was the first Conference Final since 1985 not to feature either the Boston Bruins or the Montreal Canadiens. New York made their first conference finals appearance since 1986, while the Devils made their second conference finals appearance and first since 1988. The Rangers and Devils finished 1–2 respectively in the NHL during the regular season. Despite the two teams strong regular season records, the Rangers entered the series heavily favored as they swept the regular season six game series with the Devils. With a minute remaining in game one at Madison Square Garden New York was leading 3–2. However, Devils forward Claude Lemieux tied the game on a scramble in front of New York goaltender Mike Richter. The Devils went on to win the game on Stephane Richer's breakaway goal at 15:23 of the second overtime. The Rangers evened the series winning game two in a 4–0 shutout. The series then turned to the Meadowlands in East Rutherford, New Jersey, for games three and four. Like game one, game three went into double overtime but this time it was New York who won 3–2 on Stephane Matteau's goal at 6:13 of the second overtime period. The Devils won game four by a final score of 3–1 and evened the series at 2–2. The Devils took the series lead with a 4–1 win at Madison Square Garden in game five. Despite the fact that his team trailed in the series 3–2, Rangers captain Mark Messier made a highly publicized guarantee that New York would win game six. After trailing New Jersey by a score of 2–1 after two periods Messier himself scored a third-period hat trick to rally the Rangers to a 4–2 victory. Rangers coach Mike Keenan said of the guarantee, "Mark was sending a message to his teammates that he believed together we could win. He put on an amazing performance to make sure it happened." Game seven played at Madison Square Garden, was a goaltending battle between New Jersey's Martin Brodeur and New York's Mike Richter. Brian Leetch gave the Rangers a 1–0 lead in the second period. Richter shut out the Devils for over 59 minutes before conceding a goal to Devils forward Valeri Zelepukin with just 7.7 seconds remaining in regulation. The two teams played into double overtime for the third time in the series and for the second time in the series it was Stephane Matteau who scored the game winner. Matteau scored on a wrap-around at 4:24 of the second overtime period as the Rangers won the game 2–1 and the series 4–3. This was the first and to date only playoff series between these two teams. Toronto returned to the conference final for a second consecutive year after losing to Los Angeles in seven games the year before. This was Vancouver's first appearance in a conference final since 1982 when they defeated Chicago in five games. This is the most recent conference finals series that was played entirely in Canada. Toronto won game one at Maple Leaf Gardens on Peter Zezel's goal at 16:55 of the first overtime period. After that however, the Maple Leafs could not seem to slow down the bigger, more-powerful Canucks. Vancouver edged Toronto 4–3 in game two and then shutout the Maple Leafs at the Pacific Coliseum in games three and four, by scores of 2–0 and 4–0 respectively. Down three games to one and facing elimination the Maple Leafs played much better in game five. They pushed Vancouver to double overtime but it was Vancouver forward Greg Adams who beat Leafs goaltender Felix Potvin just 14 seconds into the second overtime period to give the Canucks a 4–3 win and a 4–1 series win. This was the first and to date only playoff series between these two teams. This was Vancouver's second appearance in the Finals, in their last Finals appearance they were swept by the Islanders in 1982. The Rangers were making their tenth appearance in the Finals and first since losing in five games to Montreal in 1979. The Rangers last won the Stanley Cup in 1940. With the Rangers having 112 points against Vancouver's 85, the 27 point difference was the largest point differential between two teams in the Stanley Cup Finals since 1982 when 41 points separated the New York Islanders (118) and Vancouver (77). In a back and forth series that went the maximum seven games, one lengthy drought ended and another began. The Rangers won the Stanley Cup their fourth title in franchise history, and first since 1940, while the Canucks were the last Canadian team to play for the Stanley Cup until the 2004 Calgary Flames. This was the longest streak that Canadian teams did not qualify for the Finals from 1994–2004 (10 years). Prior to this the longest streak of Canadian teams missing the Finals was just three years. ^ "Playoff Formats". NHL. Retrieved September 21, 2014. ^ a b Goold, Derrick (May 29, 2004). "Calgary is Crazed as Playoff Finals Return to Canada". The St. Louis Post-Dispatch. p. OT9. The 10 years since Vancouver lost game seven to the New York Rangers to now is the longest span Canada has ever gone without a visit from the finals. ^ "1994 Eastern Conference Quarter-finals — New York Islanders vs. New York Rangers". hockey-reference.com. Retrieved September 24, 2016. ^ "1994 Eastern Conference Semi-finals — New York Rangers vs. Washington Capitals". hockey-reference.com. Retrieved September 24, 2016. ^ "1994 Eastern Conference Finals — New Jersey Devils vs. New York Rangers". hockey-reference.com. Retrieved September 24, 2016. ^ Jamieson, Jim (May 31, 1994). "Paper rout for Rangers". Vancouver Province. p. A54. The 27-point differential is the greatest, ironically, between Stanley Cup finalists since the last time the Canucks made the trip to this mega-city 12 springs ago. ^ Olson, Arv (June 1, 1994). "1982 Canucks were unlikeliest of heroes". The Vancouver Sun. p. E3. ^ "Flames reach Stanley Cup finals". CBC Sports. Canadian Broadcasting Corporation. May 20, 2004. Retrieved February 3, 2012. Calgary is the first Canadian team to reach the Stanley Cup finals since the 1994 Vancouver Canucks...lost...to the New York Rangers. ^ "1994 Stanley Cup Finals — New York Rangers vs. Vancouver Canucks". hockey-reference.com. Retrieved September 24, 2016.